Spring is just around the corner, which means it’s time to start dyeing eggs and searching for the Easter Bunny! We have put together a list of the Top 10 Atlanta Area Easter Events in 2019 so you and your family can make the most of your Easter weekend! Break bread with friends and family, meet the Easter bunny, hunt for eggs, and enjoy the beauty of Atlanta. We have you covered with all the highlights! The Easter Bunny gets very busy during the Spring, so don’t miss your chance to snap a picture with him this year! Spring’s favorite furry friend will be hopping by several Metro Atlanta locations with the opportunity to hunt for eggs at your favorite state parks. Certain plants contain powerful dyes that create stunning colors. Join us in this interactive program to learn more about these plants and decorate three vibrant eggs. Drop in the fun for $6 per kid plus General Admission! Sunday, April 21st | 7:00 a.m.
Two non-denominational services will be offered at both the top of Stone Mountain and at its base on Memorial Lawn. 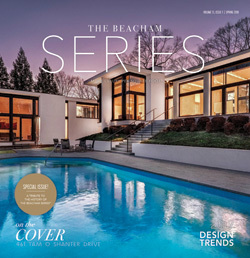 Feel like you’re on top of the world as the sun rises and paints gorgeous colors across the sky on Easter morning. The Summit Skyride opens at 4:00 a.m., so be sure to arrive at least two hours early to allow time to get to the top of the mountain. 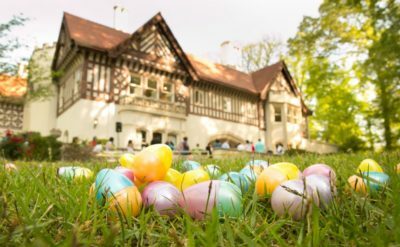 Bring your basket and your camera for a family friendly Easter egg hunt amidst Callanwolde’s beautiful spring gardens and grounds! Eggstravaganza Easter Egg Hunt features thousands of candy-filled eggs to find (including three golden “prize” eggs) and a chance to meet the Easter Bunny. There will be family friendly games, family crafts from Home Depot, face painting, and a kids’ dance floor with DJ J&M Sound Design. This year, enjoy an indoor bar stocked with coffee, mimosas, snacks, and more! In this group class at Decatur Glassblowing, students will get to make their own sculpted glass paperweight for only $50 per person. This hot-glass learning experience will start by going over safety, tools, and equipment. The instructor will then demonstrate how to make a glass paperweight. Following the demonstration, each student will go through the steps one-on-one with the instructor to create their own piece! An Atlanta classic! Georgia’s First Lady hosts the annual Easter egg hunt with Easter Bunny photos, cupcake and egg decorating, face painting, a storybook station, the Easter egg roll, a moonwalk and more. Many Atlanta restaurants will be offering special menus for the Easter holiday. Break bread with friends and family at the best local restaurants! Many locals stops serve up special menus, kid-friendly fun, delicious fare, and brunch cocktails! Monday, April 8th | 10:00 a.m. – 1:00 p.m.
Join the Atlanta History Center’s Smith Family Farm for the annual egg hunt and win prizes! Toddlers and preschoolers are welcome to search for hidden eggs, dance the bunny hop, and create spring crafts. The Easter Bunny will also make a special appearance! The St. Regis Atlanta invites families and friends to an extravagant Easter celebration. The hotel will be hosting a refined southern brunch in Astor Court Enjoy exquisite cuisine, live jazz, Mimosa & Bloody Mary station, Easter egg hunt, crafts for children & more! Saturday , April 13th | 11:00 a.m. 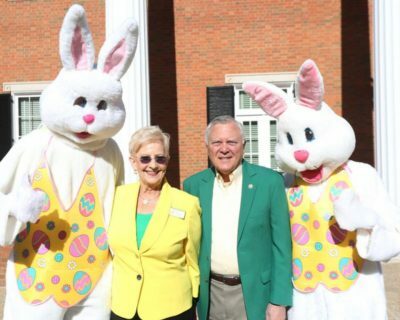 The Easter Bunny is arriving to the lawn of Decatur First Baptist Church where families will enjoy hugs and photos with the Easter Bunny before hunting for eggs! Beginning at 11:00 a.m., the egg hunt is staggered by age groups so that parents with more than one child, in different age groups, can experience the fun with each of their children.